Examples, examples, and videos to help GCSE Maths students learn how to find the highest common factor (HCF). The following diagrams show the methods that can be used to find the Highest Common Factor. 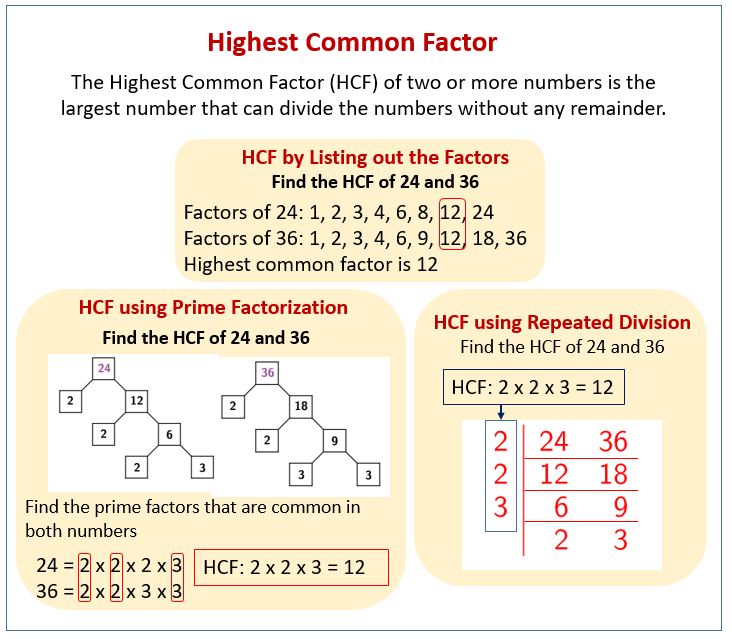 Scroll down the page for more examples and solutions on how to find the Highest Common Factor. How to find the HCF? 1. List out all the factors of each number and select the largest factor that is common to all the lists. 2. Use prime factors or factor trees. 3. Use division (ladder) method. This video reviews how to find the Greatest Common Factor (GCF) of a pair of numbers using the upside down division (ladder) method. This video provides two examples of determining the greatest common factor by using prime factorization.